Microsoft estimates that there are about 30 million PowerPoint presentations created every single day—which is why if you’ve spent time in an office, you’ve probably spent time looking at something that was built in PowerPoint. If you have to give a talk accompanied by slides and you’re not the most tech-savvy person, PowerPoint is a great option because you don’t need to spend months learning how to use it. Instead, there are some easy steps you can master that will help you create a presentation that looks great and lands masterfully. Here are seven of the most basic and powerful things you can learn about how to make your best PowerPoint presentations that are persuasive, engaging, and beautiful. Your first step to designing the best PowerPoint presentations is familiarizing yourself with its tools and commands. You should learn where they are and how to use them. PowerPoint was designed with a ribbon, or a toolbar that runs along the top of the application window and contains most of the tools and commands that you’ll use frequently. The ribbon is organized into tabs, and each tab contains a grouping of related resources (for example, in the “Home” tab, you can find tools for the most common actions that users need, like adding text boxes or creating new slides). Before you start designing your presentation in PowerPoint, spend some time exploring the ribbon. This way, you’ll understand how to use it and be able to navigate it quickly during your presentation creation process. In addition to the intuitive ribbon, PowerPoint also has a Quick Access Toolbar, which can sit either above or below the ribbon. The Quick Access toolbar is customizable, so you can add the tools that you use most frequently to it. No matter what ribbon tab you’re using, the Quick Access toolbar always remains visible, which means it’s a convenient solution for speeding up and simplifying your process. 3. You’ll see all of the commands that can be added to the toolbar. Choose the ones you want to have in front of you. 4. Hit “Okay” or “Save,” then your toolbar will be updated. Pro-tip: Re-order your commands so that, for example, all text formatting commands are together, or all alignment buttons together. 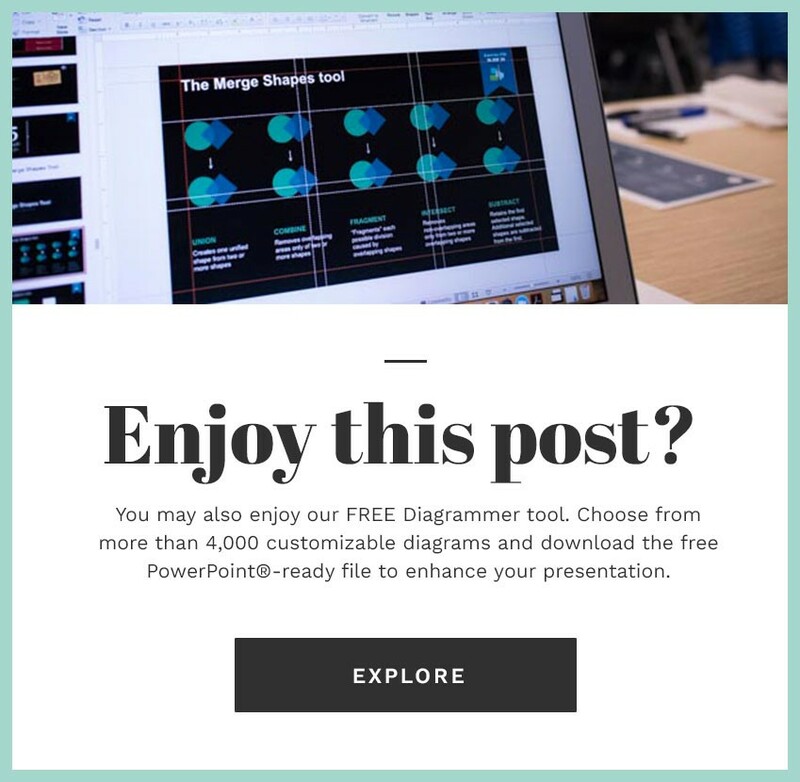 Two of the main visual goals for the best PowerPoint presentations are: to create something aesthetically pleasing and to display information clearly. You can tackle both of these aims at once by relying on grids in PowerPoint. Grids are the underlying slide structures of a presentation, and they are made up of vertical and sometimes horizontal lines. Grids can aid you in creating a presentation whose slides are balanced. While grids are proportioned and made up of straight lines, they are actually surprisingly flexible and can be set up in a limitless number of arrangements. PowerPoint Guides allows you to create your own custom grids for your presentation, so you can create a slide structure that best suits your information—then automatically implement that structure across all of your slides. When it comes to designing the best PowerPoint presentations that are enjoyable to look at and deliver a clear, memorable message, it’s important to remember: less is more. You should rely on a simple visual system when designing your slides, with only a few colors and fonts, so that your audience is not distracted by busy visuals—and so your brand or messaging remains consistent and recognizable throughout. Choose two colors and incorporate these in the design elements throughout your slides. Consider choosing the colors used in your branding materials, or, think about the psychology of color. Research has shown that certain colors can make people feel a certain way, which could, in turn, influence their mindset. Use only two typefaces in your presentation. By keeping your font choice simple, you can help people focus on the content of your presentation and minimize the chances that they have to do extra work to process new or unexpected visual information while you talk. If you want to grip your audience visually, add photographs to your PowerPoint presentation. Stunning photographs grab the attention of viewers and pull focus, which means they’re a good tool for minimizing distractions during your talk. They can also be thematic, which can help to further reinforce your Big Idea. The content you choose to include will also have a significant impact on how your presentation lands. So, take some time to make sure that you’re tailoring your talk and the text you include properly. One key step to making sure you are including the right stuff on your slides (and leaving the right stuff out) is getting to know your audience. By taking some time to consider the people who will be taking in your presentation, you can be intentional and specific about what they see and hear, then, increase the chances that it will engage and move them. To get to know your presentation audience a little bit better, consider where they are now (in terms of mindset, belief, or situation) and where you want them to be when you’re done presenting. Then, think about what changes they’ll need to make in order to get where you want them to go. A helpful tool for discovering what stories and information will land with your audience is the Audience Needs Map. This seven question guide gets you thinking about your listeners beyond their profession, helps you get to know them better, then guides you in narrowing in on the right stories, facts, and concepts. Your presentation might include lots of interesting data and important information, but ultimately, it should only have one overarching message or takeaway. We call a presentation’s main focus its Big Idea. Your Big Idea is essential because the best PowerPoint presentations can be beautiful and the accompanying talks can be eloquent, but if people don’t leave with a clear, coherent takeaway, then your talk was all for naught. Once you’ve determined your Big Idea and gotten it down on paper, you should ensure that every component of your presentation supports that idea. Each design element, bit of text, and image should all serve to bolster your main takeaway. If something does not, remove it, or frame it in a way that helps connect it to your message. In order to keep your presentation visually clear, make sure you only put one idea on a single slide. By adhering to the one-idea-per-slide mindset, you can minimize the potential of your audience getting distracted from what you’re saying. To make sure that you stick to the one-idea-per-slide strategy, create a title for every single slide. Then, as you design the slide, regularly check to make sure that the information you’re including aligns with the title at the top of the page. If it does not, make sure to remove it, or include it on a slide with a relevant heading. If you are trying to learn how to make the best PowerPoint presentations, the essential steps are simple. With just a little exploration of the program and some practice using it, you can master the art of making presentations that work, and return to the application again and again to take advantage of all of its capabilities.